A local resident, one who is a particular nuisance (I’m understating here!) 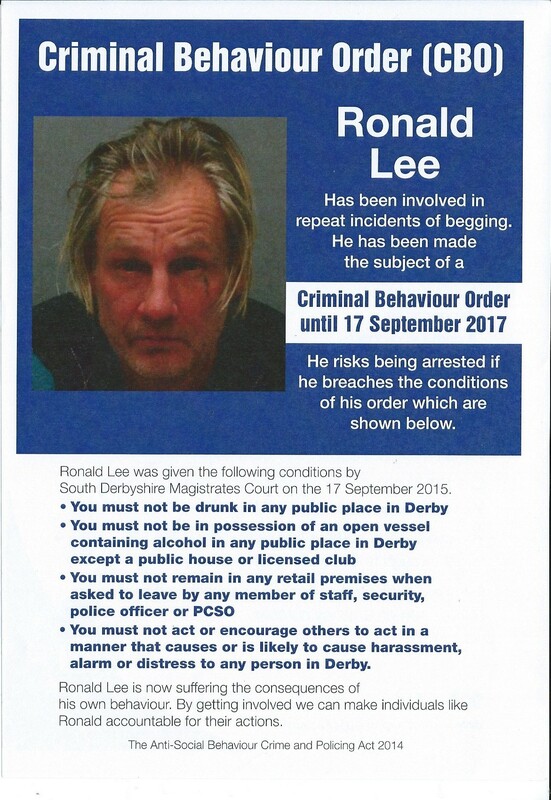 has been given a Criminal Behavior Order, as many will have seen via the leaflets the Police have issued around Chester Green. The resident in question has been convicted many times for assault, shop-lifting, being drunk and disorderly, threatening behaviour, carrying a knife, assaulting a police officer….the list goes on! Currently, Ronald is serving 16 weeks in prison. Anyway if, when he’s released from prison again, you witness him doing anything abusive, drunk or disorderly etc. (see the list on the poster below – click for a bigger version! 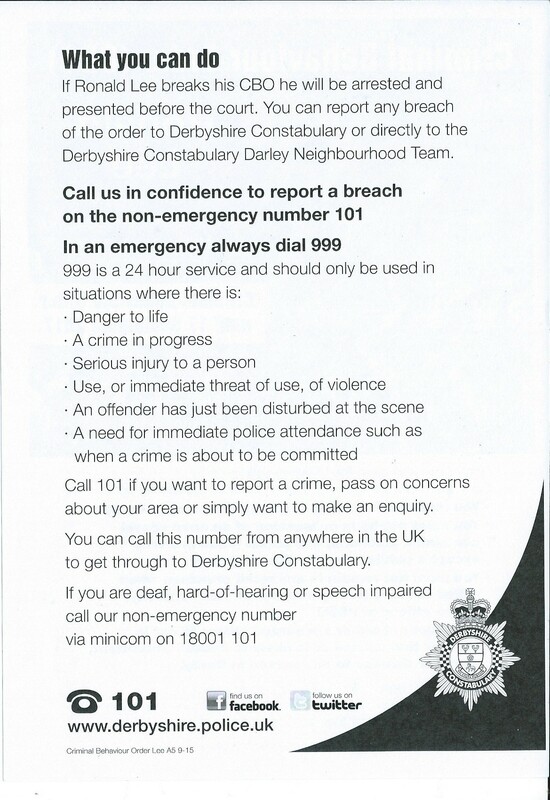 ), then report it straight away to 101 or, if an emergency, 999. A CBO means anything on the list is an instantly arrestable offence. Many thanks to Darley Policing Team, Derby Homes and local residents who have made this CBO happen! LCRA October Newsletter with Correction! The OCOR [Our City Our River] project is not planning on using any of the garage area on City Rd as a compound –I apologies for any confusion the discussion caused at the Board meeting. how much formal garaging might need to be provided, (could some garages be removed? a review of what a re-configuration of more parking spaces and what a revised layout might look like. There would need to be retention of easement for properties which have access from the rear of their properties into the existing car park area. We are not proposing that this area is used for compound- we are proposing that undertaking some work may increase and provide benefit for parking provision whilst the OCOR works are undertaken.